After missing the annual High Tea and Bunny Melt last year due to home renovations, we wanted to bring it back this year. We were both busy, so we tried to scale it down a bit--but we also felt the urge to make it nice. So we had a plastic tablecloth (because we've had too many fondue-spilling accidents), but brought out the nice china and the silver. 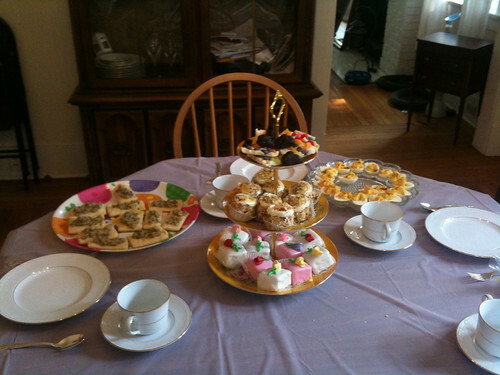 I'm really glad we had people over and we had the nice china and silver. It feels like we're moving upward toward being the kind of social people we want to be and that we've been in the past. Edit: It's been pointed out that I didn't actually talk about the "bunny melt" part. This year, we were full enough on all the other goodies that we never actually brought out the fondue pot.